Hold on to your seats ladies! I got a preview of Laura Mercier's Summer 2012 Collection, Belle Nouveau, and trust me, by the end of this post, you will be itching to head over to the mall to grab every single pretty pastel piece! The press event was held at White Space's, The Comissary. Who better to talk about this new collection than one of the industry's best, not to mention sweetest and funniest make-up artists, Jeffrey Tasker! It was my second time meeting him and I was surprised that he still recognized me despite my chopped blonde hair. I love him. Seriously, this guy can make you look like a supermodel in a minute. He has magic fingers and the knack for using one product in three different applications and it works. The beautiful model for the day, former Ms. Universe. I think her face pefectly matches Laura Mercier's flawless face aesthetic. And finally...the new line up! Seriously, I haven't felt this way about a collection since 2011's Portofino. And just to give you a heads up, these are all limited edition and sold out in the states already. This is pretty cool..check out the new packaging...Laura Mercier created these pop out palettes for the Sheer Creme Color, Creme Lip Print, Blush and Powders so you can create your own perfect palette with a new pallette organizer coming out this year. Genius right? The palette is flat which makes it perfect for travelling, and also has a compartment for your make up brushes! Watch out for that. I think it'll be out by June. This here is the Creme Lip Print which has a velvety matte texture and is non-greasy. Jeffrey Tasker used this as an eyeshadow, blush and lipstick on the model and it looked pretty damn amazing every single time. See, that's what I love about Laura Mercier. Her products are idiot-proof. I used to be so afraid of applying make up before because I used to always end up looking like a clown. With Laura, that's just impossible. And that's the great upside to buying make up created by a woman herself. She understands our needs, wants and insecurities so she is able to deliver them to us exactly the way we want it. They also introduced their new Oil Free Supreme Foundation which will replace the old Oil Free Foundation with a better non-drying formula that works on all skin types, when I say all, I mean ALL. This new foundation comes in 11, yes 11 different shades. Im sure yours is a definite perfect match for one of these. And here's another MUST-HAVE and GOD-SENT to all of you with oily lids and all day events, the Eye Canvas. A primer that will keep your eyeshadow in place even if you swim! This works on the oiliest of the oily and is Laura Mercier's favorite product which she kept secret until now. God, I am SOOOO in love with these Sheer Creme Eye Colours!!! They come in 3 shades, Mauve Pastel, Grey Pastel, Aqua Pastel. To make it simple for you, light gray, mint green and lavender and oh-my-god. THEY LOOK SO PRETTY when used all together!!! You can even apply it with just your fingertips! Just sort of rub them on for instant eyeshadow. They are sooo dreamy! They don't actually turn blue. The blue just gives it a sort of deep brightness to make your lashes more visible. I love how it dries so quickly on my lashes and IT DOES NOT SMUDGE! Even with my very teary eyes. Not one, but this time, 5 or is it 6? 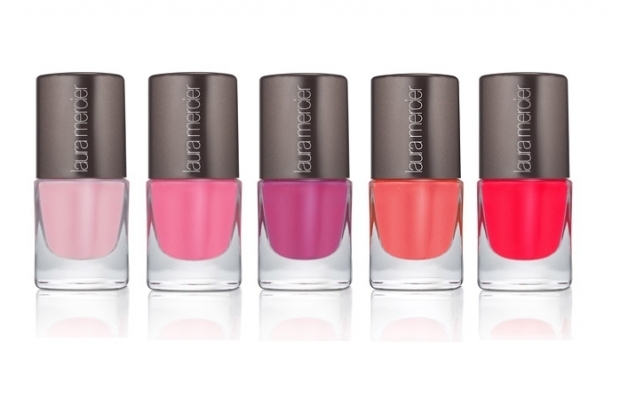 Limited beautiful shades of Polish! Gorgeous, yummy and quick drying! Laura's latest Tone Perfecting Eye Gel Creme ( a high-tech miracle worker which gets rid of lines and puffiness instantly by depuffing the skin around wrinkles! ), yes, my wish granted! The lavender polish, and blue mascara as well as the Eye Canvas and Mineral Illuminating Powder! Now all I have to buy are those Sheer Creme Eye Colours ( only P995!!!) and maybe another shade of polish! I suggest you all head over to a Rustan's Dept Store nearest you, make a beeline for the Laura Mercier counter and ask for these. I guarantee, once you try out these shades on yourself, you will fall head over heels in love with them like I did. I WANT EVERYTHING!!! ndi ba super light un eye canvas? ?nwei loveloveloooove everything! !I want that mascara!! the nail polishes look so pretty! :) i should probably give LM a try.